Let’s face it: The threats to your schools’ security—both physical and electronic—are getting more and more sophisticated. And the best tool for protecting your schools against these threats, according to experts, might surprise you: a robust, IP-based network. It goes without saying that a well-designed and well-secured network can help keep data thieves from targeting your schools. But a robust network also is an advantage as video surveillance cameras, alarm systems, emergency-alert systems, and other security tools become converged on a single IP-based network. Using a single communications infrastructure, you can remotely manage and control all the security tools you have at your disposal, quickly and easily. That means you can be more proactive in preventing an attack—and more effective in responding if one should occur. Although a robust IP-based network may be the most efficient way to protect your school, there are additional ways to be proactive about protecting your electronic products. That is why Spectrum Industries has created a line of laptop and notebook carts and cabinets. Spectrum has been manufacturing laptop storage and charging carts since 1995. Recently, our customers’ needs have focused on laptop security and the increased mobility of laptop carts. In turn, we have designed robust laptop carts – using the same quality that Spectrum has always been known for – to suit the needs of today’s learning environment. Spectrum laptop carts combine vault-like laptop security with ease in mobility to provide resourceful laptop carts for the classroom environment. 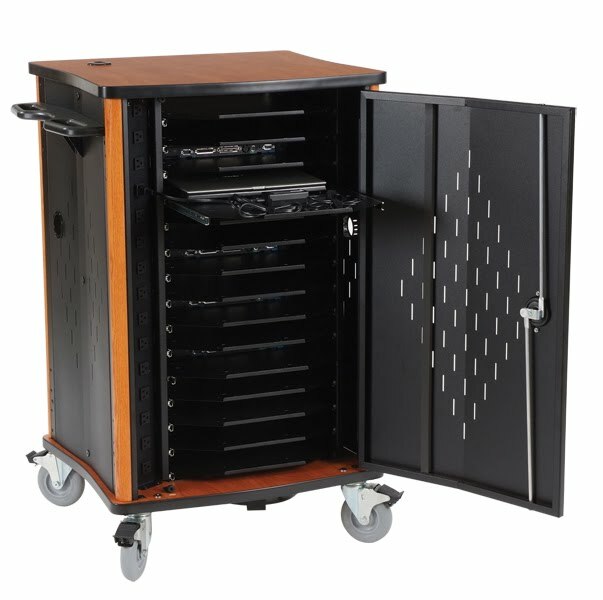 Although the our carts are undeniably heavy-duty laptop carts, they feature a lightweight footprint with high-quality balloon casters to provide easy laptop access within a classroom or between separate classrooms. Our custom made double-bolt lock provides the utmost in laptop security, whereas our competition often uses padlocks on their laptop carts that any bolt cutters can quickly bypass. We use 16 gauge steel as a frame for our laptop carts, carefully ventilated to offset heat buildup from the laptops charging inside. Our 1” thick high-pressure laminated bases and tops add a touch of class without sacrificing laptop security – as opposed to carting around a simple steel box offered by other manufacturers. In addition to our laptop carts, Spectrum has designed a laptop locker that provides ventilated laptop security for up to 8 laptops per module. It is designed to be bolted to the floor and/or wall to pro vide the ultimate in laptop anti-theft security. 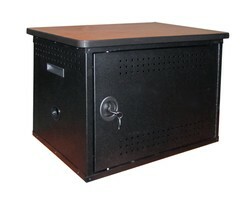 The Secure Laptop Locker is constructed of 16-gauge steel and laptops within are protected by a double-bolt lock to provide vault-like laptop security. The Secure Laptop Locker is modular so that units can be bolted together for expansion needs. Whether you are looking to store 8 or 30 laptops Spectrum's laptop and notebook carts and cabinets are easy solutions for your laptop management needs; providing easy-access storage, re-charging, security and mobility for laptops one classroom at a time. For more information on choosing the right security solutions for your students and schools visit the eSchool News archives, and for more information of Spectrum Industries line of laptop carts visit Spectrum Industries website. Spectrum Industries - manufacturer of laptop security systems for over 15 years.